How to Promote an Event in Constant Contact - Time-Savers, Inc.
Holding events, large or small, is a great way to deepen relationships with your customers and to attract new customers. But successful events don’t happen without a little work. To create a prosperous event campaign, you need to come up with a strategy that not only incorporates email, but also social media, mobile, and web — so that you can gain exposure to the event, reach the right audience for your business, and drive meaningful results. Unlike most newsletter or drip email programs, Constant Contact is not all about emails. By simply browsing Constant Contact’s landing page, you’ll quickly discover that it’s easy to create events, coupons, share on popular social networks, and utilize the other valuable features that are available to help you better interact with your customer base. 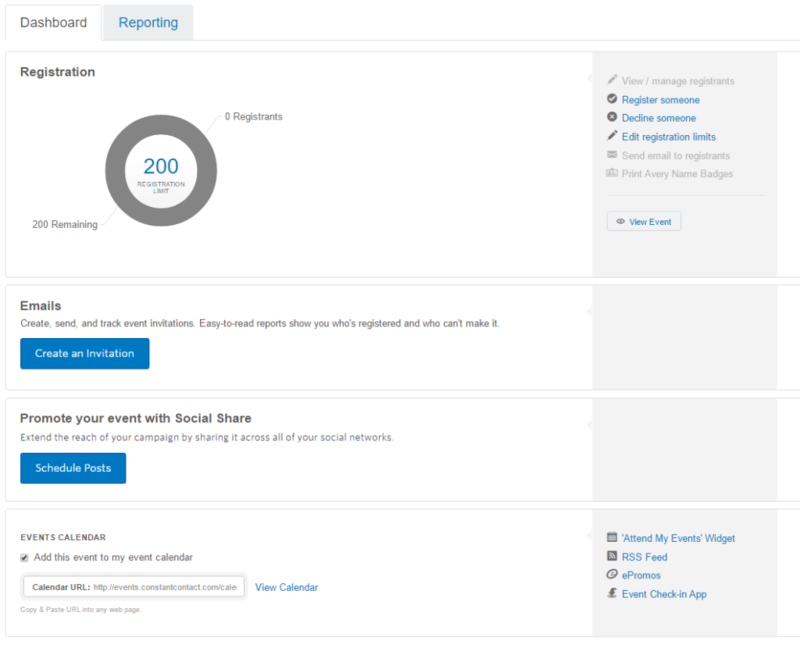 Using the Event Campaign Tool from Constant Contact will help you manage your event, spread the word easily, track signups, and follow up with attendees. Regardless of the event, whether it’s a seminar, open house, or a fundraiser, the eventual goal is to get as many people as desired to attend and turn them into customers. To get the most out of your efforts, check out our suggestions to help you increase attendance through proper event promotion techniques. The truth is that people are busy and schedules fill up fast, so you need to ensure your event is on everyone’s radar as soon as possible. Share a firm date and basic information via email and social posts as soon as you have it available. This will be your first step in “generating buzz” about your event. We suggest that you complete this task at least 4-6 weeks before your event. Set up an event landing page and registration form with a Collect Event Registrations campaign in Constant Contact. Not a technical person? Don’t worry, Constant Contact makes it pretty easy by offering predesigned themed templates and a step-by-step environment. You will have your event up in no-time! Now, that doesn’t mean there won’t be some technical mojo required for specific event needs… as an example, you have the ability to add links and additional content to your notification emails. Putting some extra thought into this could turn your declined responses into donations or new subscribers. Also, you can sell products and get pretty creative with your fees. In the below example I listed different fees for sponsorship levels, a normal priced ticket and a “special” priced ticket which is only available with use of a coupon code. Again, design is fairly straightforward. Constant Contact fills most of the information out for you and presents you with editable text boxes allowing you to enter text, images and more. Now it’s time to start sharing your event with the world! Get the word out with email invitations and posts on your social media pages. Another suggestion is to add your details (landing page link) to any relevant third-party or local event listings website. Lastly, think about writing a supporting blog post on your website to let readers know how important the event is and to offer a sneak peak of what they will get by attending your event. Around 3-4 weeks before your event, send out an official invitation to your target guest list. You can do this through your event dashboard inside of your Constant Contact account. At this stage in the event planning process, registration for your event should be already open and ready to accept submissions. A customized invitation makes the recipient feel wanted, and this could be the one factor that persuades him or her to register for your event. The invite should plainly outline the key event details and explain how attending the event will be beneficial to them. Try and keep the invitation concise. You can link the invite to your landing page to provide additional information about your event and allow for registration. When your events are open to the public, it’s smart to use social media marketing to spread the word to customers. Social media allows you to promote your event several times a week, which you shouldn’t do with email. You can also develop an advertisement to increase awareness to your event. Tweak your wording a little for each pitch to your social networks so that it doesn’t look like you’re continuously posting the same thing. Ensure you link to your event landing page for more information. By using the online registration tool, registrants can share and inform other registrants that they’re attending. By allowing people to see who else is attending, you increase the likelihood that others will attend as well. Also, you can allow the registrants to share the event on their own social networks. This is a suitable way for them to spread the word. When creating your event campaign you have the option to add a branded hashtag that will help you link live tweets to the event. Registrants will see the hashtag in their confirmation email, encourage them to use it! All of these creates social proofing – which is the perfect way to continue building buzz for an event! Track event interest with Google Analytics. As soon as you link Google Analytics to your event campaign, you will be able to see where the traffic to your event landing page is coming from, know if and where things are falling flat with your registration process, and collect geographic information on where your registrants are coming from. Knowing this information can make your efforts over the next few weeks more effective. With the help of your event dashboard, you can quickly print out attendees’ name badges, export a list of attendees to send to the venue and your team, plus so much more. It is also simple to add a company logo or custom graphic to your attendee badges with just a few clicks. As soon as you have a better idea of the headcount, you can use that same design product to create promotional items such as customized water bottle labels, place cards, and brochures and so on. At Your Event: You will want to make sure you either use the Constant Contact app, text to join flyer or a manual email capture form at your event. Either one or all of these options will help you collect data from attendees who may have walked through the door to join your event, rather than registering online. Send a post-event “thank you” and survey. After the event is over, it’s vital to send out a thank-you email to your attendees. With Constant Contact, you can include a survey to receive feedback on event venue, timing, food, entertainment, demographics and so on. To run a successful event, promotion is key. It can help you increase engagement with your current contacts as well as reach people that might not be in your funnel yet. Have questions about using Constant Contact for your next event? Leave a comment, or email us – we would be happy to help!